THE BOOK: Spring into Light. THE PUBLISHER: World Group Press. SUMMARY: In this novel, Tito finds his childhood friend and marries her, but later two old flames, Margie and Laurie, attempt to enter into his new life. Tito returns to his birthplace and accidentally runs into two women, relatives, later realizing one of them still remembered a promise had to (one day) marry to her when she was only seven years old. However, he must first deal with immigration issues in America before he can put together the proper resources to become a spouse. Can the well-educated immigrant from a low-income family emotionally withstand his no-nonsense future bride and the distractions of his American ex-girlfriends? WHY THIS TITLE? 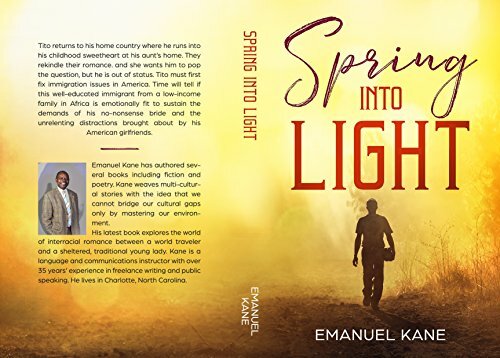 : I chose the title, Spring into Light, as the main character found light by returning to his birth country. He met his best friend, and she taught him more about himself and life. “Interesting character description. Raises that often asked the question of Can we go back home and if we could what would it look like? And of course who doesn’t like to read a little romance. I couldn’t wait to turn the next page.” — Sara G.
Tito sat on the full leather chair facing a shelf loaded with a massive television screen, picture frames of children and adults, and volumes of an encyclopedia. He rested his elbows on the arms of the chair, feeling his buttocks slowly sinking away.